It’s exactly two weeks since my arrival to Alaska today. Two weeks ago I didn’t know almost anything about life here, about mushing and training racing dogs or tell the difference between summer and winter poop of a moose. Now I do, at least the last part. In those last two weeks I had only two days off as we have plenty of tourists group coming to the farm. Since I am very lucky boy I had amazing weather on both of them. First trip I have made in Alaska was a little bit unexpected and not planned at all. On that Saturday I went with puppies for a walk to the forest at 7 am as usual. On the way back I met Vern, returning from his own walk. I didn’t know about him being outside that early but he was already returning from 7 miles long walk. He had to start really early. Anyway he offered me to take one of his car and go for a trip. So I was just wow, okay. I was definitely not expecting it to be that easy. As soon as I was finished with puppies and dogs I left. My first trip was to the probably most important city in area, Talkeetna. This city is one of the bigger ones in Alaska, almost 900 people live there and serves as a last place to buy supplies before travelling to natural parks up north. On my way there I met a golf course, right next to a road. As some of you already know I try to start playing golf, so I stopped to have a look on it. I realized very soon, that it doesn’t look like normal golf course. There was something different. Then I finally understood what the strange sounds I’ve heard were and realized that it’s a shooting range. I am going to try it next time. Talkeetna is surrounded by lakes so I stopped at one of them and went for a walk. After a while I found the END sign. Right next to it was a huge satellite so I was feeling like at some secret military base looking for UFO. On my way back to car I found this nice peace of paper informing about bears in area. Luckily I haven’t met them. After this I was ready for some lunch so I headed straight to Talkeetna. I had my first real American burger. Well, it wasn’t so much different to the McDonald’s. There were so so so many people in Talkeetna I couldn’t believe it. It’s a beautiful city with almost three streets and many small shops and places for tourists. On my way back I was thrilled with the idea that I am sitting in a huge car, driving across Alaska and listening to “Top 30 country songs of all times” on local radio. We have a whiteboard at the farm with a schedule of when will groups of tourists come to us. I am checking on that board regularly and one day a mysterious one word record appeared – Fish. There were no other scheduled things on that day. The mystery was revealed right at the beginning of that day, after puppies & poop duty, when Vern opened the freezer. The freezer is little bit smaller than my bedroom. There were plenty of frozen fish inside and I had to cut them in small pieces for the dogs. We took all the fish out and I start cutting them while Vern left to the city. So many of you were almost right while asking if I am going to Alaska to fish. After two hours I thought that it’s not the worst work in the world, it went pretty well, and because the fish were totally frozen, there also wasn’t almost any smell or blood. Well, this changed after another few hours, because they were all outside of the freezer. So at the end of the day, there were plenty of small parts of fish and slime. Luckily I had plenty of small helpers to clean/eat it. I have met another person who is kind of working at the farm at the beginning of week. Her name is Gwen and she was racing with our dogs this year in Iditarod. Unfortunately she couldn’t finish the race, however she is going to next year. She will move in to the farm at the beginning of October and will train with the dogs for the whole winter until the race, which is at the beginning of March. In those few months dogs will run some 4500 – 5000 km in training. She is a really tough chick and dogs love her. 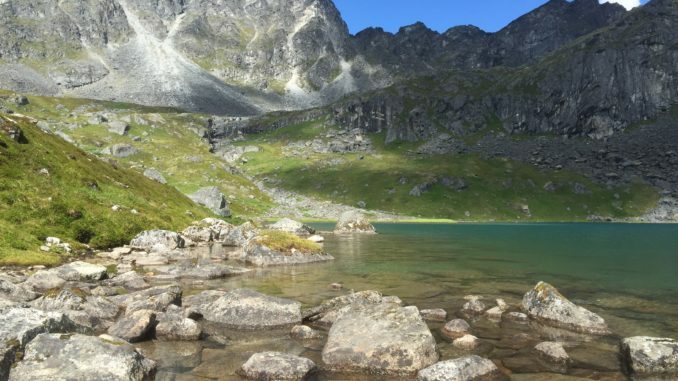 She also recommended me another great place for a trip to the mountains, the Hatcher Pass. After few days full of work another free day with no scheduled tours appeared. And again the weather was wonderful. I’ve borrowed the car again and went to Hatcher Pass. The pass is named after Robert Hatcher a miner and prospector. There are plenty of gold mines in these mountains, most famous one is Independence Mine. First problem appeared when I found out that the road, with great name Archangel road, I was going to take to the mountains is closed. Never mind, it’s only couple of miles. I was so excited about being in mountains finally that I was enjoying every single moment. On my way up there I met some ten people. Out of these ten I will describe three. First one I’ve met was a dog walker. As you might figured out I like dogs very much so I started to play with that one, but still kept walking. The dog was great white fluffy Labrador. I always try to compliment the owner that is taking good care of the pet so I just said “beautiful”. The girl wasn’t shy at all, simply answered “Thank you” and introduced herself as Lisa. After a while our paths has split and I continued forward to Reed Lakes up in mountains. At that path I met a really wild looking man with a hat, big stick and huge knife. He waited for me to catch up with him and we continued together till another crossroad. His name was Bill from Alabama and he was doing this trip alone for nearly 2 months. Just travelling in a car, camping alongside the road. He used to be a coal mine engineer, who just wanted to visit these gold mines. He also carried a full equipment for harvesting gold dust from river. During our conversation I’ve heard the first Alaskan joke ever. It was something like this. Two friends went camping into the mountains and as they were sleeping a bear woke them up. One of them started to run without his shoes immediately, while the other one took a long breath and started to take on his shoes. The first one start screaming at him “What are you doing? You can’t outrun a bear. The second boy simply answered “No, but I can outrun you! boulder for a moment and then split. Jack continued to the Upper lake while I had to hit the road back, as the time was my enemy and I had to go back to farm to feed the dogs. That’s also why I couldn’t stop at the Independence Gold Mine. Hopefully next time. On the way back I was standing in front of a decision like from movies. To take the longer safe road or to try my luck on much shorter but more dangerous road. As I was rushing back to my dogs, who were missing me so much for sure, I opted for the shorter road. Well there is a reason why that road is open only in July and August, as it would be totally not doable in heavy rain or snow. Even thought it was only 80 km I couldn’t ride faster than 30-40 km per hour. The road was not a road, it was just a dust with huge rocks. In first half an hour I felt pretty scared that something will break on the car. In the next half an hour I was just wondering what and when will break. In most critical moment radio started to play Born in The U.S.A by Bruce Springsteen, my courage increased by 100% and pedal to the metal I went forward. As a matter of fact the road back took me even longer than the safety one I used in the morning. When I finally got back home the dogs were so truly happy to see me that I gave them little bit more food than usual.